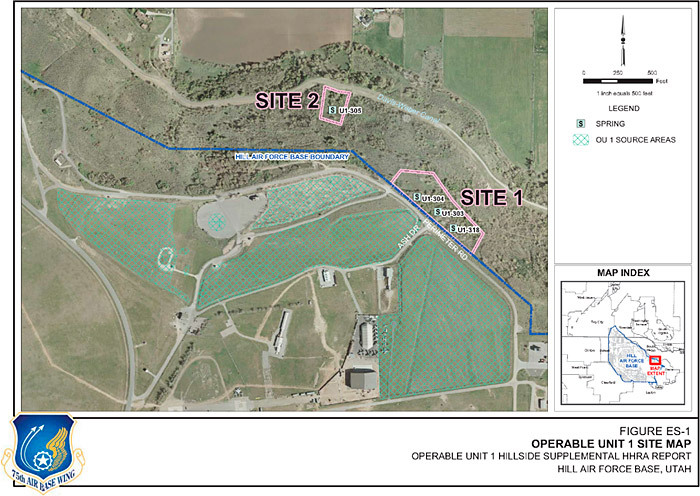 The subject site is Site 2 on a hillside adjacent to Operable Unit (OU) 1 at Hill Air Force Base. Figure 11-5 is the site map for the Operable Unit 1. Figure 11‑5. Hill Air Force Base Operable Unit 1 site map. Source: (CH2M 2011). Supplemental Human Health Risk Assessment Report for the Operable Unit 1 Hillside. Hill Air Force Base, Utah. December. OU 1 contaminant sources consisted of pits and landfills where solvents and other chemicals were managed historically. Although arsenic wastes were not specifically managed at OU 1, it is suspected that geochemically reduced groundwater conditions, exacerbated by disposal of wastes in the OU 1 landfills, mobilized arsenic occurring naturally in the subsurface soil. The arsenic was then deposited on the hillside when groundwater emanated from historically flowing seeps and springs and contacted air. Currently, the arsenic-impacted soil appears as stained surface soil along the steep hill slope. Because the springs no longer flow, the contaminated spring “sediments” are currently more like surface soil than subaqueous sediment from the perspective of environmental fate and transport and potential human exposure. These “sediments” are therefore referred to as soil. A Record of Decision (ROD) was available for the site, which included excavation to a remedial goal (RG) of 11 mg/kg arsenic. The measured naturally occurring background concentration was 11 mg/kg. The ROD also addressed an adjacent site (Site 1) on the hillside, and when the RG was applied to Site 1, it resulted in a larger-than-anticipated volume of soil requiring excavation, which caused concern regarding slope instability and the practicality of implementing excavation to 11 mg/kg at Site 2. Therefore, excavation of Site 2 was delayed due to concerns regarding slope instability. An in vitro bioaccessibility (IVBA) study was conducted on Site 2 soil to support a supplemental HHRA and future risk management decisions for Site 2. Due to concerns regarding slope instability and potentially large volumes of soil requiring excavation, the hope was that incorporation of site-specific relative bioavailability (RBA) data into a supplemental HHRA would yield risk estimates within USEPA’s acceptable risk range and that remediation would either not be required or the area requiring remediation would be smaller (than the area based on the RG incorporating a default RBA of 80%). Note that 80% was USEPA’s default RBA for arsenic in soil at the time of this study, but the default has now been changed to 60%. The focus of the study was to characterize the site-specific arsenic mineral speciation and oral bioavailability of arsenic in soil at Site 2. Samples were collected near areas where higher arsenic concentrations (>40 mg/kg) had been identified by previous sampling events or where visually stained soil was observed. The sample locations were selected subjectively, because samples with arsenic concentrations less than 40 mg/kg may give highly variable results for the IVBA testing method and may contain insufficient arsenic-bearing mineral grains to conduct mineral speciation. In order to achieve spatial representation for Site 2 from the most arsenic-impacted areas, samples were collected from three separate zones along the more contaminated dry channel that extends downhill. Four grab samples were collected from a depth of 0 to 6 inches in each zone. A total of 12 samples were collected and submitted for analysis of total arsenic. Total arsenic concentrations in the samples submitted for bioaccessibility testing ranged from 105 to 458 mg/kg. The local background level of arsenic was not established. Red stains reflect the presence of iron-rich minerals that formed when the metals-bearing groundwater came into contact with the atmosphere as it emerged from the springs on the hillside. The site is currently undeveloped private property along a steep hillside with evidence of numerous landslides. Although development of the site is limited by the naturally unstable soil along the hillside, a future residential scenario was evaluated in the supplemental HHRA to provide an upper bound on potential future exposures. In addition, a trespasser exposure scenario was evaluated. Arsenic bioavailability testing was performed using methods presented in the USEPA document titled Region 8 Recommendations for Quantifying the Bioavailability of Lead and Arsenic in Soil for Use in Human Health Risk Assessment (USEPA 2010e). Following receipt of the Site 2 total arsenic results in the 12 samples, six samples were selected for arsenic speciation and IVBA testing. The six samples selected for speciation and IVBA testing contained total arsenic concentrations across the range of concentrations detected in the 12 samples and also provide spatial representation across the Site 2 sample locations. The IVBA samples were submitted to the Laboratory for Environmental and Geological Studies (LEGS) at the University of Colorado-Boulder for arsenic speciation and IVBA testing. Dr. Drexler and USEPA Region 8 maintain a database of corresponding IVBA and RBA data from arsenic-bearing soil samples from at least 40 different sites. The IVBA and RBA data from these sites have been plotted against each other to generate an in vivo – in vitro correlation (IVIVC) with an r2 value of 0.76. Using the linear equation generated by this IVIVC, site-specific IVBA data can be used to estimate site-specific soil arsenic RBA values. The estimated RBA values can then be incorporated into HHRA. Arsenic speciation conducted with an electron microprobe of the six soil samples from Site 2 demonstrated that 98 to 100% of the relative arsenic mass is associated with iron oxide/hydroxide forms. The six soil samples contained between 118 and 438 mg/kg total arsenic in the 250-micron-or-less fraction and were characteristically dominated by a single mineralogical host (iron oxide/hydroxide) for arsenic. Using the database IVIVC, and the IVBA values from the six soil samples, the calculated range of RBA values is between 10% and 24% (see Table 11-3). aRBA values predicted by the IVIVC linear equation from the available corresponding RBA and IVBA data. 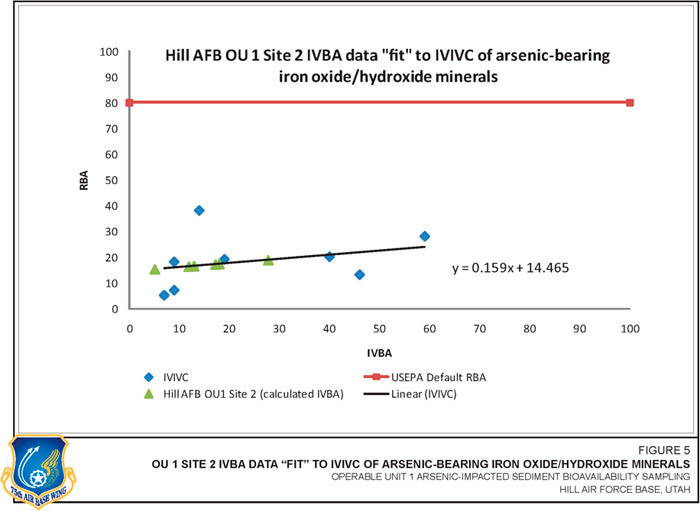 bSee Figure 5; RBA values predicted by the IVIVC linear equation from corresponding RBA and IVBA data from arsenic-bearing iron oxide/hydroxide minerals. Arsenic-bearing soils with high iron oxide contents have been shown to have lower RBA values than the IVBA values predict (Drexler 2010). Therefore, the USEPA supports refining the database used to generate the IVIVC to include only sites with soil mineralogy (for example, iron oxide/hydroxide-rich soil data) similar to the investigation site. For this evaluation, corresponding RBA and IVBA data from eight arsenic-bearing iron oxide/hydroxide-dominated soils were used to generate an IVIVC (see Figure 11-6). When the IVBA values from the six soil samples are fit to the linear equation of the iron oxide/hydroxide-dominated soil IVIVC, the calculated RBA range is 15 to 19 percent, with a median RBA value of 17% (see Table 11-3 and Figure 11-6). Figure 11‑6. OU1 Site 2 IVBA fit to IVIVC of arsenic-bearing iron oxide/hydroxide minerals. Source: (CH2M 2011) Supplemental Human Health Risk Assessment Report for the Operable Unit 1 Hillside. Hill Air Force Base, Utah. December. “These approaches illustrate the low bioavailability of the Hill AFB soils and support the use of IVBA predicted bioavailability values for a risk assessment instead of using the default value.” (Dr. John Drexler of Laboratory for Environmental and Geological Studies (LEGS), personal communication with George Tangalos and Michael Novak CH2M HILL. January 2010). Based on the results of the arsenic speciation and IVBA testing, Dr. Drexler recommends use of IVBA predicted RBA values rather than the USEPA default RBA value of 80%. These revised risk estimates are within USEPA’s acceptable ELCR range (10-6 to 10-4) and do not exceed USEPA’s HI threshold (1). This arsenic bioavailability study was performed to reevaluate potential site risks and the need for site remediation. Six soil samples were analyzed for site-specific arsenic speciation and IVBA analysis. The revised risk estimates were within the USEPA acceptable risk range. Based on the revised risk estimates, the project manager decided that further remediation was not required at Site 2. This resulted in elimination of the need for excavating the approximately 1,470 cubic yards of soil estimated in the Operable Unit 1 Arsenic-impacted Sediment Remedial Action Work Plan Supplement (CH2M 2008). Community outreach on this site included meetings with stakeholders where the topic of bioavailability was discussed.